it should not do it. Thanks for analyze and fix if possible. 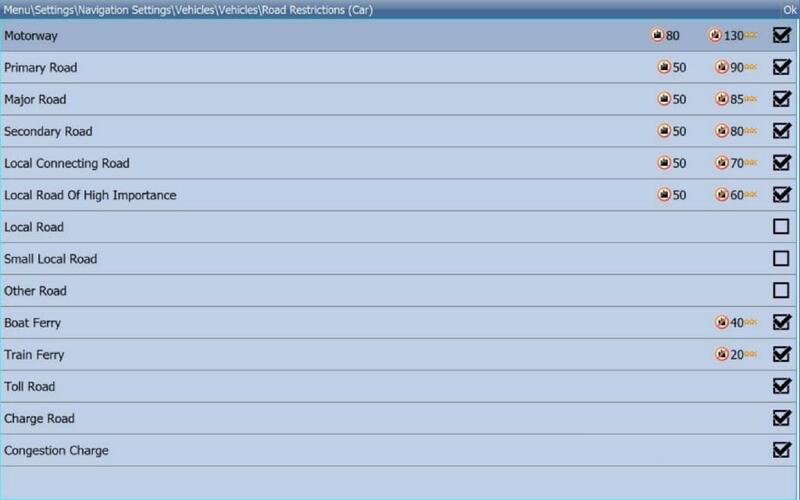 Check that your currently active vehicle profile (is it Pedestrian, by any chance?) does not have "Other Road" active. I've recorded the same navigation mistakes into Navigator Free as dammat has. My navigation settings is the same as dammat's. I think the problem is with OSM tags at the place, that there is a combination of "access = yes" and "motorvehicles = no". The problem with correct navigation appeared when footway has drawn. In my ID osm editor I have a left panel named "Zugangsbeschränkung", in english "Access Restriction". There is Allgemein=yes, General=yes. Probably automatically set und perhaps wrong? I use to draw JOSM editor and there is no possibility to automatically add (when it is not defined; footway and path aren't) to highway=footway or highway=path any next tags. I can do it but only in the further action. We should not add tag "access" to footway and path becauce Navigator Free has a problem with correct navigation. OSM maps are universal stores and maping only for Navigator is unacceptable. Ok that true, but routing algoritm should do that only if there is no other way and only for deperture. For destination point application should let us know that we sholud no go there with motor vehicle and end the route on the nearest way with correct access. Dammat, why don't You want to solve this problem, by adding basic tags to this line? In Potlatch2 vehicle profil, for this line, is unset - hope, changing it to prohibited, can improve Your routing. David, Your destination point is on the footpath - it is covered by road. If You agree drive through the restriction area, You get it. Why solving this problem on the level of single line if it could be done global for all lines by improve application? Footway/cycleway/path are use to walking/cycling - NOT FOR DRIVING. When I drive a car I have to use only roads by car and there is no matter if destination point is closer to footway or to typical road for cars. Navigator in my opinion should stop navigate as the nearest the target as it can but only on road by car (of course if I'm going by car). I'll show you other examples - also in Sedziszow. ...hmmm, Your destination point is still on the footpath, so You decide and You get it. There are a lot of footpaths covered by roads. You can use search engin to avoid such problem. IMHO it is ok, for some type of cars and that we can choose it. Out of curiosity I routed the above 2 examples and they are completely ok. Not using footpaths. Using PC version 12.3.0 with map from 28-04-2014 with standard car. Result is independent of routing mode. I set however departure and destination on the road and not beside it. The screenshots tell me it's a PC version, so an .apk is of no use. Ok, route goes through footways/paths when deperture or destination point is on footway/path, it is ok for me. But still, in below situations, route should not go through footway/path. Deperture and destination are on highway=track, where motor vehicle are allowed. In Poland there are a lot of villages, where only access road is highway=track. I think Navigator should be usefull not only on cities with residental roads, but also on unpaved villages roads. Tomas I use navi based on windows CE. For you: destination point is not on the footway. Dammat, I'm not an expert, but You can use Potlatch2 in simple/basic mode, and add more tags for all this roads - in tab Restrictions change 'unset' especially for motor vehicles /to allowed?/. Adding more data /tags/ give us better result. For footpath - motor vehicles - prohibited. I think it is the fastest way. David, Routing Mode - Fastest! Przemek tell me more what I have to do - what does it mean "Routing Mode"? I have to mention that above destination points were always found by using search engine. 1. Menu - Settings - Navigation - Routing mode - Fastest. 2. Menu - Settings - Navigation - Vehicle type - Car - Edit - Road restrictions - Local road (and Small local road) - enabled. Now You get the best routing, on the road, and than "by foot", if Your car has no special permissions. IMHO it is better, like it is. I have exactly the same settings as you has written about. I can talk more - your settings = facotry settings. Can anybody compare how it works on Navigator Free-android and Navigator Free-windows? ...maybe somebody else can help? The same is on Android, but more difficult set destination on the footpath. If I am in pedestrian mode, I can set start and destination also to any path (not in the wild, on a house for example). Routing follows paths (obviously as soon as possible, if start is on a road). Looks very smart to me. But does not work in image http://images62.fotosik.pl/979/287c099d9fbbed8d.jpg. Car routing uses path, not so smart. Windows, WINCE and Android route exactly in the same way. 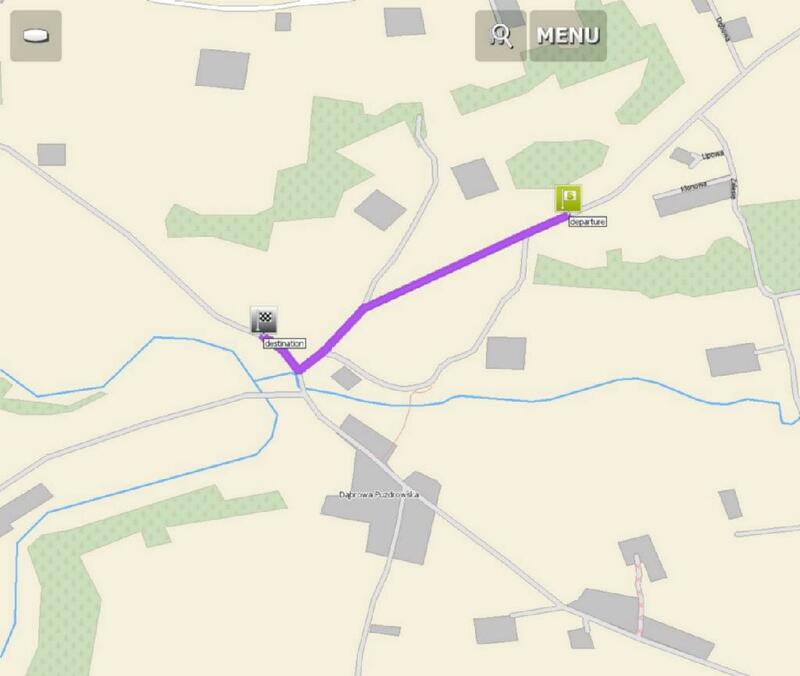 For your Sedziszow examples, if departure and destination are set ON a road, routing does not use footpaths. Your 2 examples with the coordinates are exactly like your pictures above, the first one going through the path. I want back to my case. Correct me if I am wrong but I understand that for now highway= track, footway or path are the same category for NF = not accessable by default for motor vehicles. I have suggestions, that highway= track, but only with tracktype=grade1 and grade2 (http://wiki.openstreetmap.org/wiki/Key:tracktype) should be for route alghoritm more than highway= track (grade3-5), footway and path but of course less than unclassified and residental. I think track with tracktype=grade1 and grade2 are acceptable for motor vehicles if there is no other options. What You think about that? Now I understand your voice in this discussion. I had email from MF technical suppport dated 19.05.2014. They confirm that problem we are talking about exists in Navigator Free app (OSM datas are good). If you really don't understand, you can leave it, like it is. People from MF support are very polite. Przemek which version of maps is good in your opinion? I saw this crossroad on Streetview and I want to be fair with Google, so I have to tell you "I don't know". Please try to simulate they by NF. In above cases NF informs: go through!!! The first, and the second is rather simple - start point is on restricted area (road). The third (turbo) is o.k., but check update (2014-06-28:Polska). I have the newest map of Poland (issued 9.06.2014). The first two cases - NF navigates in the same way when a road is under construction or road is opened. I drived this road many times beffore it was closed. NF always said: go through. I suggest wait for comment from MF - I don't know which angle is computing as 'through', and which as 'turn'. 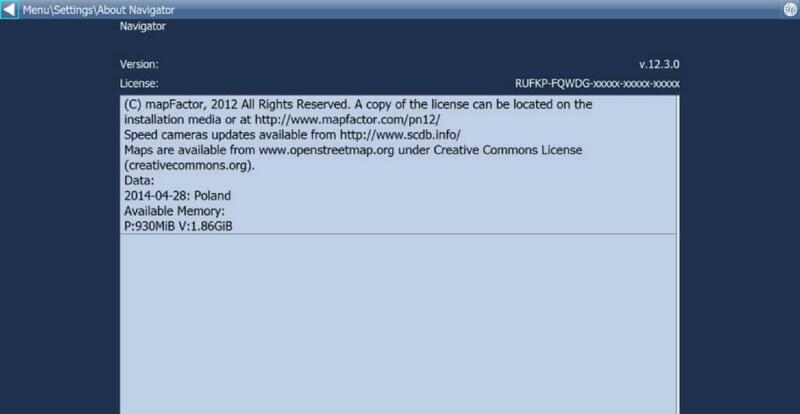 Przemek I'm sure you know that maping in OSM for one apps (NF in this case) is forbidden. OSM datas have to be universal. Show me in http://wiki.openstreetmap.org/wiki/Main_Page topic where I or everybody can read about correct/incorrect angle of roads connections. Mapping for universal means also for navigation. Program, algoritm has to decide which angle means through, and you have to ask about it programmers, or support. If you want, you can improve maps or buy commercial. Przemek I understand what "universal" means. 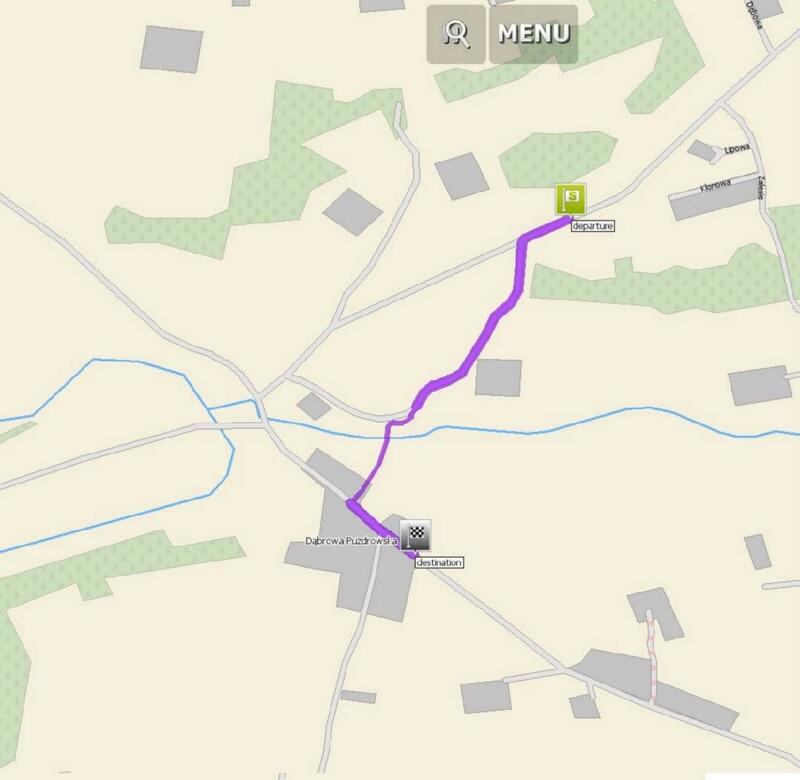 I map in OSM from time to time and try to improve it specially for navigation. Of course I can buy commercial maps but I don't want it. I think we rather shoud talk in this forum about NF developing than what I can do or not. I ask you once again: do you able to show me in http://wiki.openstreetmap.org/wiki/Main_Page topic where in written how to map roads connection? I want to learn it. I think that short note left on OSM finish this conversation.